Maureen was born in 1953 to Edna and Michael Noel McBride – the only girl with four older brothers. Maureen grew up in Nelson, which is a beautiful part of the top of the South Island of New Zealand with lovely beaches, walkways and very pleasant climate. She received her primary and secondary schooling from the RNDM sisters and no doubt this is where her vocation to religious life began. Maureen entered religious life with the Sisters of Our Lady of the Missions in 1972 and after two years of Novitiate in Christchurch made her First Profession in December 1974. She proceeded to do university study and completed an MA in languages and literature at Auckland University. We all know that Maureen had wonderful intellectual abilities and loved learning. She was an avid reader and loved exploring ideas and possibilities. After her year at Teachers’ Training College, she joined the staff of Sacred Heart College, Lower Hutt and taught languages – French and German as well as being the Director of Religious Studies. Maureen’s genuine enthusiasm for learning, could engage and encourage others to develop to their full potential. During her early teaching years, there was a strong movement in justice and peace in the Church and developments like social analysis gave people a deeper understanding of what was happening in society and how one should respond in faith and action. Maureen was fully active in this. In 1986, Maureen had the opportunity to study at Maryknoll Institute in New York where she later graduated with an MA in Theological Studies in Justice and Peace. She had a six months’ mission experience in Senegal which had a profound effect upon her and she greatly appreciated. She returned to New Zealand and began teaching theology at the Catholic Institute of Theology in Auckland. 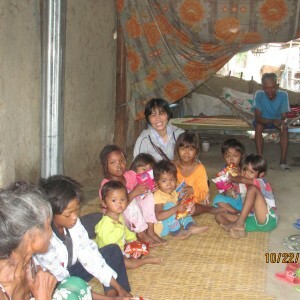 Maureen had a deep yearning to go on international mission and in 1992 she was missioned to the Philippines. She immersed herself in mission in the Philippines learning Tagalog and all that was required to understand life and culture there. She loved the Philippines and many sisters and people have benefited from her teaching and her generosity of spirit and friendship. She was the formator of our first two Filippina sisters Fe Felizarta and Corazon Cagalawan as well as teaching at Notre Dame University in Cotabato City for seven years. In the year 2000 she was appointed as leader of the Philippine region. 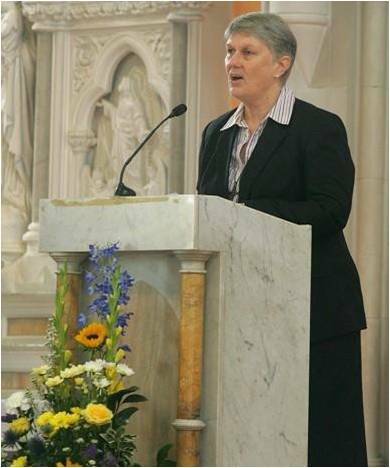 In 2002, Maureen went to the Congregation Chapter and was elected Congregation Leader. She served two terms as Congregation Leader and over those twelve years achieved much. Through her visitations to provinces and regions she came to know each sister in the congregation personally. So many of our sisters know Maureen very well and that is why our grief has been so deep and tangible. There have been many very significant events throughout Maureen’s twelve years of leadership of the congregation as she expanded the horizons of our missionary hearts. 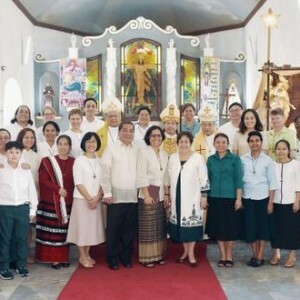 At the 2004 Enlarged General Council, a decision was made to have a common program designed for all sisters in Temporary Vows preparing for perpetual profession. The venue was Davao City, in the Philippines and an international team of sisters was appointed. In 2006, the first program was held. The six-month program has deepened the knowledge of the sisters about our RNDM charism and spirituality, the life of Euphrasie and many other related topics. The eleventh program finished in the first week of last December and Maureen gave the participants input on the Constitutions just one month before her death. Maureen was passionate about deepening our understanding of our identity as RNDM Missionary Women. Through her teaching, sharing and inspiration we have come to know more about the profound faith, wisdom, courage and determination of Euphrasie Barbier, in founding our Congregation, and the remarkable gift of her fundamental intuition into the Divine Missions. When Maureen was re-elected at the 2008 Congregation Chapter, a significant part of the mandate was to rewrite our constitutions. So began a four-year process which involved every sister in the Congregation. It was an extraordinary experience of deep reflection on the essence of our call to consecrated life and the remarkable insight of Euphrasie Barbier into the Divine Missions and the Trinity as the source of all missionary activity. The rewriting of our constitutions invited us to a profound renewal of our mission, communion and contemplation. On Thursday 24 November, I gave Maureen a copy of the published Constitutions. The task was complete and the joy was very evident on her face. In 2011, the 150th year since the Foundation of the Congregation was celebrated across the globe. This Jubilee Year with the theme of Treasuring our Past, Shaping our Future led to spiritual renewal, formation, rewriting of the Constitutions, deepening our unity and the quality of our communion, renewing our missionary zeal, reviewing and restructuring finance and administration. There are so many significant events to recall. Another is the Enlarged General Council Meeting which was held in Vietnam in 2012. This was a great joy as it was the first time in our 95 year history in Vietnam that we were able to hold an international meeting there with the permission of the national government. Maureen’s enthusiasm for mission led her to make the commitment of six RNDMs to the UISG Solidarity with South Sudan project and she was the first president of the Board. Still today our congregation makes a significant commitment of personnel with four sisters on mission there. Other new missions were opened in Kazakhstan, Taiwan, Laos and the borders of Thailand and Myanmar in Kawthaung and Ranong. There is so much one could say about Maureen and I am sure we will continue to recall many memories and stories. I am reminded of some words from Chapter 31 of the book of Proverbs: “Who shall find a valiant woman? A pearl of great price is she. Her associates all have confidence in her and benefit from her expertise. She initiates good, not evil, every day of her life”. Maureen you have been that valiant woman – gentle, steadfast, diligent and unstinting in your service to the congregation, Church and society. You have given without counting the cost and entered wholeheartedly into whatever you are committed to. You have been broadminded with a global perspective, learning from your experiences and always willing to share that learning with others in a kind and engaging way. You have left us a huge legacy of your writing and research particularly from your work during your sabbatical in Nijmegen. You have been strong and resourceful, overcoming difficulties and setbacks with hope and courage. You have opened your heart to each one of us. We thank you Maureen for the gift that you have been to each one of us. For many you have been the light in the darkness and the hope that brings vision and possibility. You have been this for our RNDM congregation and for many others – religious and laity. For us, you have “fanned the flame” brightly. May you now rest well in God’s eternal love and peace.